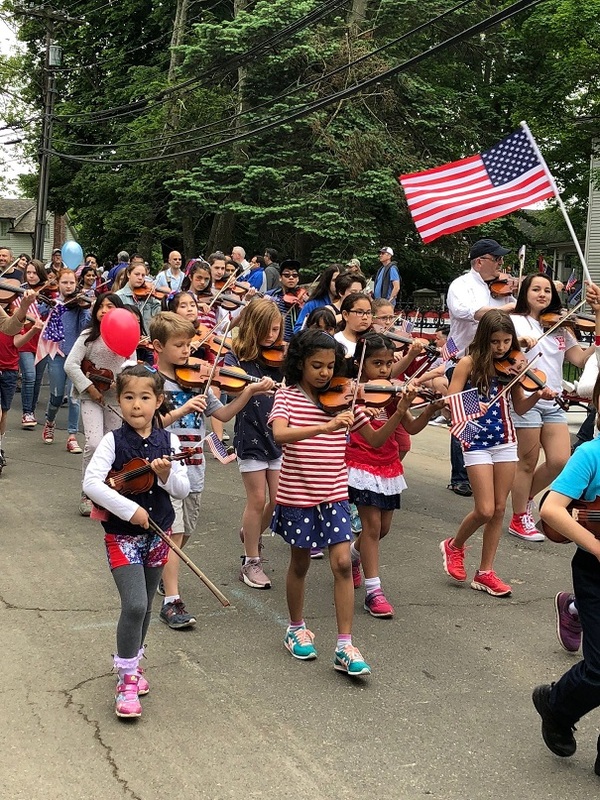 After today’s parade — after all the police, firefighters and EMTs marched past; after all the Little Leaguers, Suzuki violinists and Y gymnasts romped by; after the Y’s Men’s perennial award-winning float brought tears to the eyes — several hundred Westporters headed to Veterans Green. 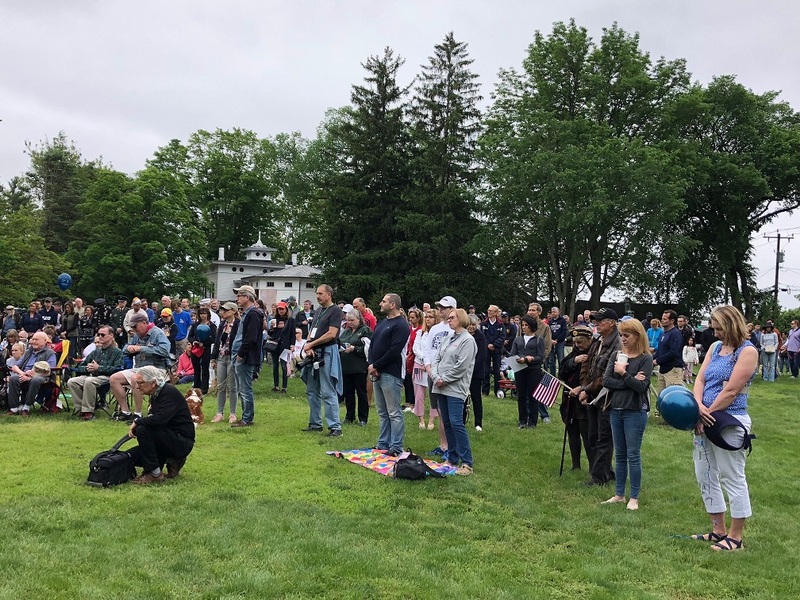 There — across from Town Hall, surrounded by the doughboy statue, monuments to war dead, and a flag at half-staff — the real meaning of “Memorial” Day took place. 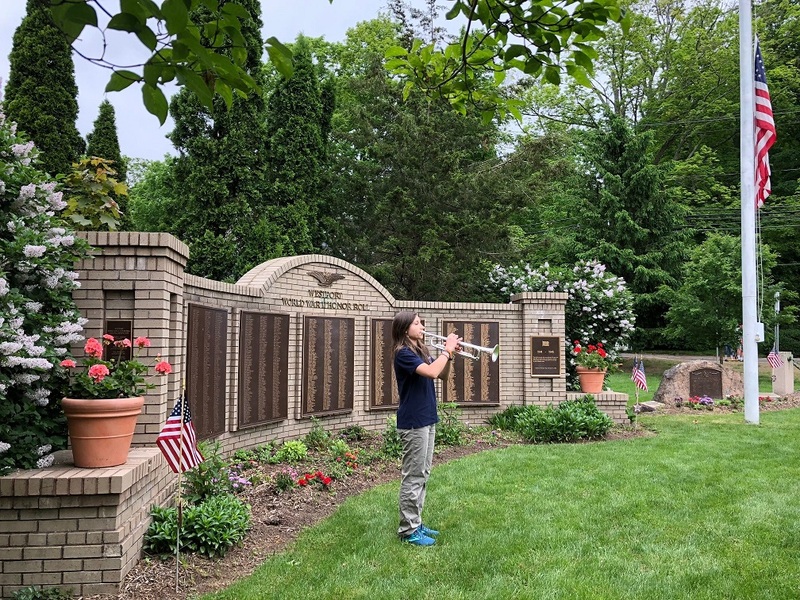 With patriotic songs, insightful remarks, the laying of a wreath, a 21-gun salute and mournful “Taps,” we paid tribute to the men and women who gave the ultimate sacrifice. They are the reason we are here today. 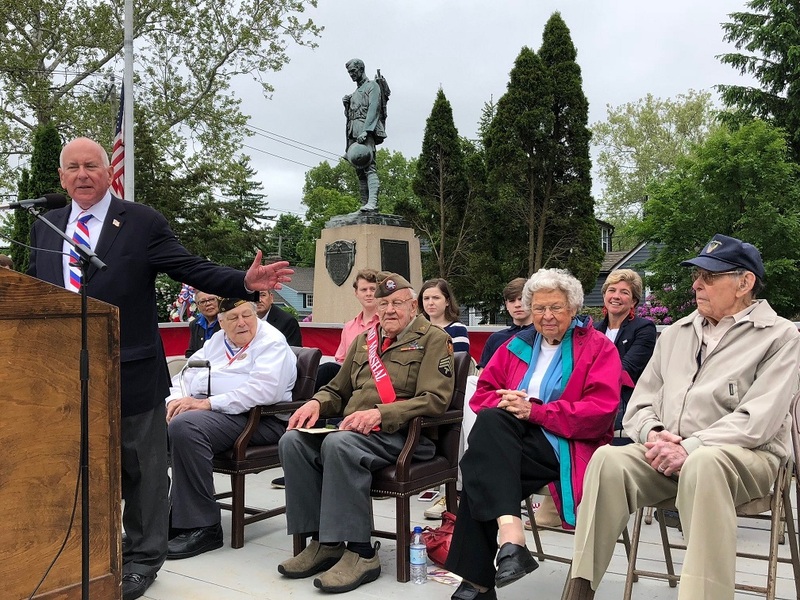 First Selectman Jim Marpe acknowledges (from left) parade organizer Bill Vornkahl, grand marshal Larry Aasen, his wife Martha Aasen, and 101-year old veteran Ted Diamond. 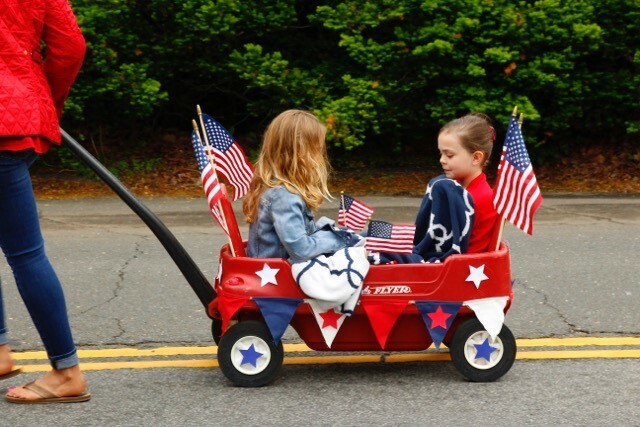 Memorial Day 2018: The Parade! 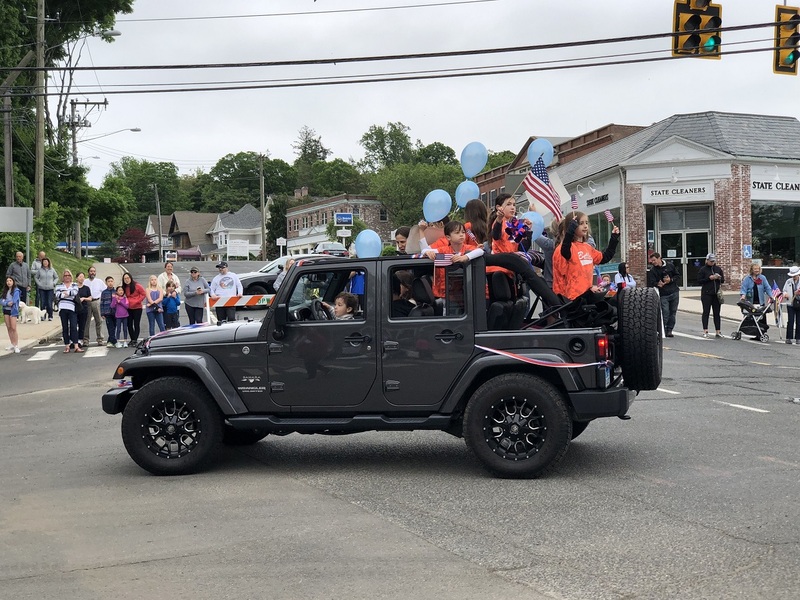 For the first time in 3 years, Westport’s Memorial Day parade was on. It was cloudy and cool — but no one cared. 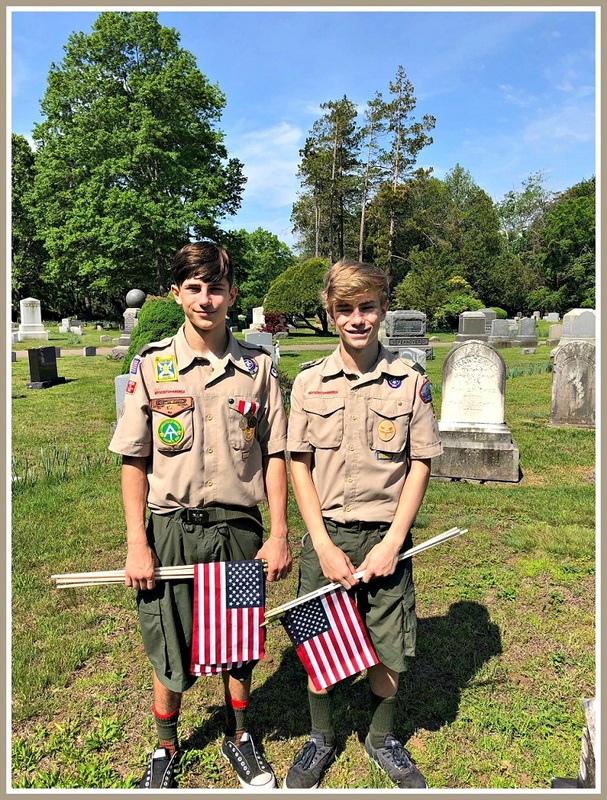 One of our town’s greatest traditions took place again. 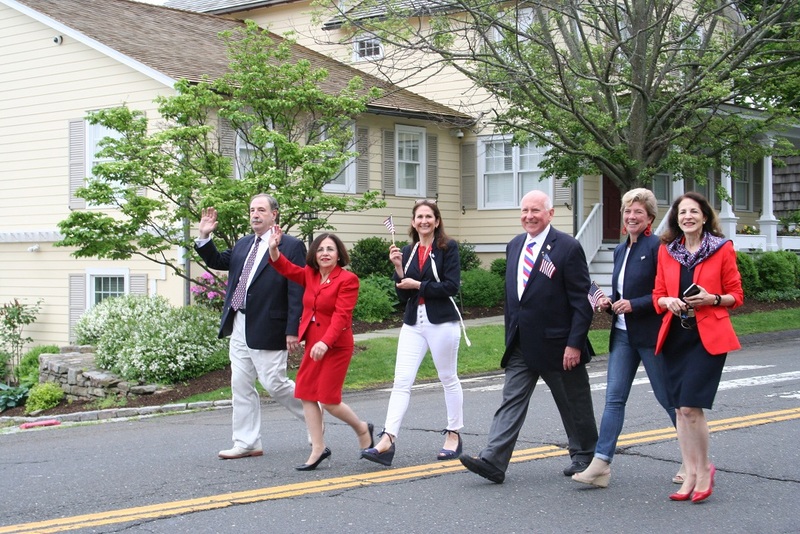 From Riverside Avenue, over the bridge, up the Post Road and across Myrtle Avenue, it was a beautiful red-white-and-blue day! 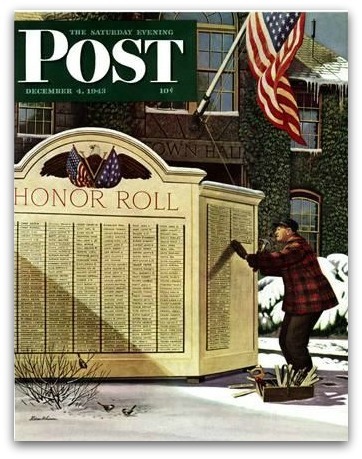 On December 4, 1943, the Saturday Evening Post cover featured Westport illustrator Stevan Dohanos’ painting of our town’s Honor Roll. 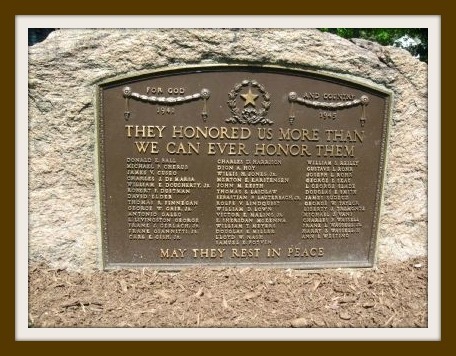 In fact, it honored all the Westporters then serving in World War II. In late 1943, victory was not yet assured. It was a terrible time. Many of those whose names were outside Town Hall did not make it home. 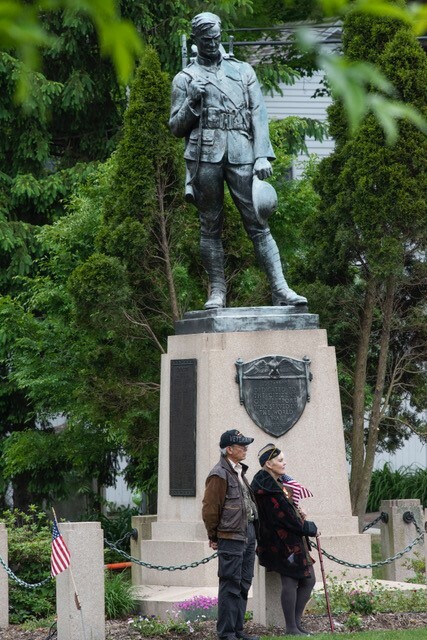 Veterans Green is also where a ceremony takes place, immediately after today’s parade (approximately 10:30 a.m.). 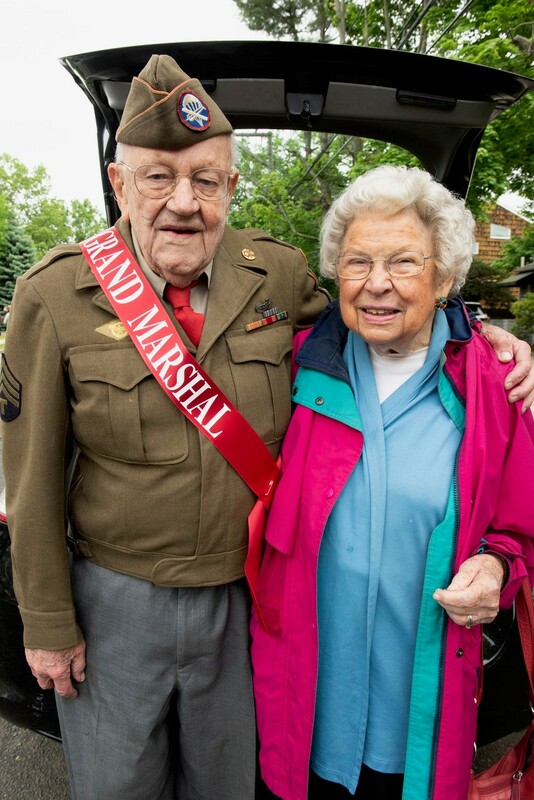 Grand marshal Larry Aasen — 95 years old, and a World War II veteran — will deliver the keynote address. So many Westporters have sacrificed so much, to ensure the freedoms we have today. 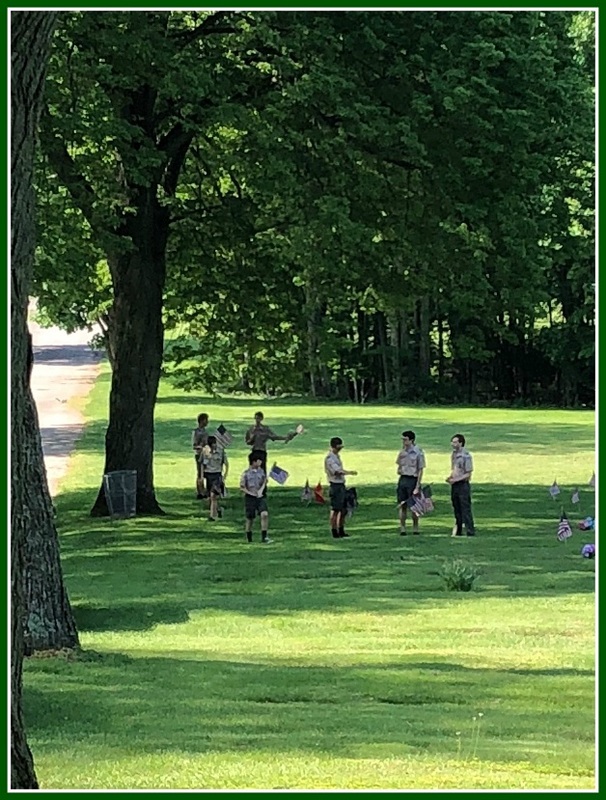 The brief Veterans Green ceremony is one small way by which we can honor them. Going To The Parade? Send Photos! Posted on May 26, 2018 | Comments Off on Going To The Parade? Send Photos! 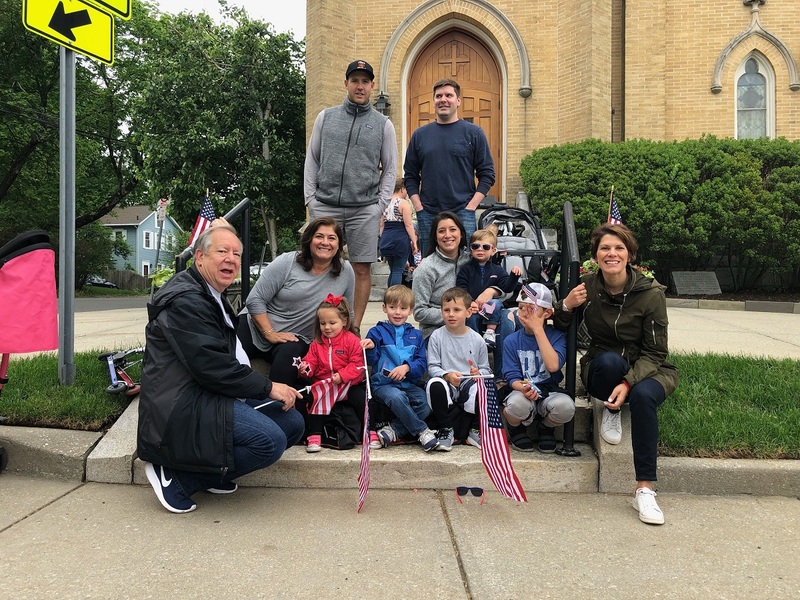 The Memorial Day parade is one of Westport’s favorite town events. Everyone has a favorite spot to watch from. Everyone has a favorite band, float or marcher to photograph. But why share them only with a few hundred dear pals, casual acquaintances and random how’d-they-get-on-my-list Facebook “friends”? 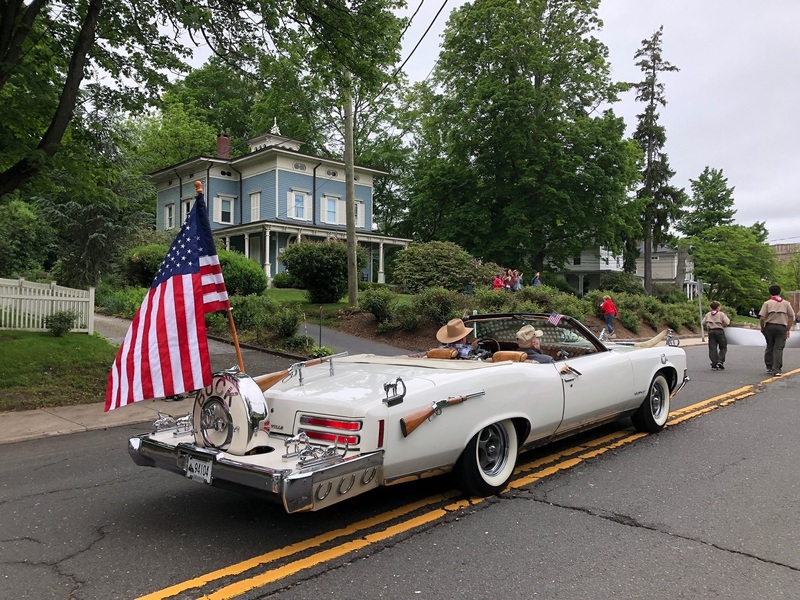 On Monday — weather permitting — let all of Westport see “your” Memorial Day parade. Send a few (not all!) of your photos to “06880” (email: dwoog@optonline.net). The deadline is 1 p.m. Please include brief identification, if needed, and of course your own name. I’ll post some (not all!) in the afternoon. And be creative! We want special photos, for our special parade. 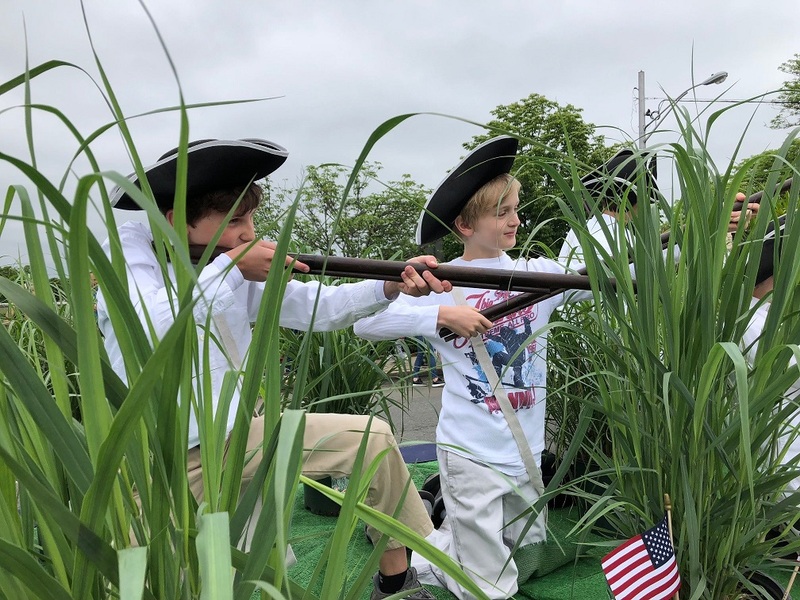 Westport celebrates Memorial Day in many ways. Here’s one shot from the parade route. Comments Off on Going To The Parade? Send Photos! 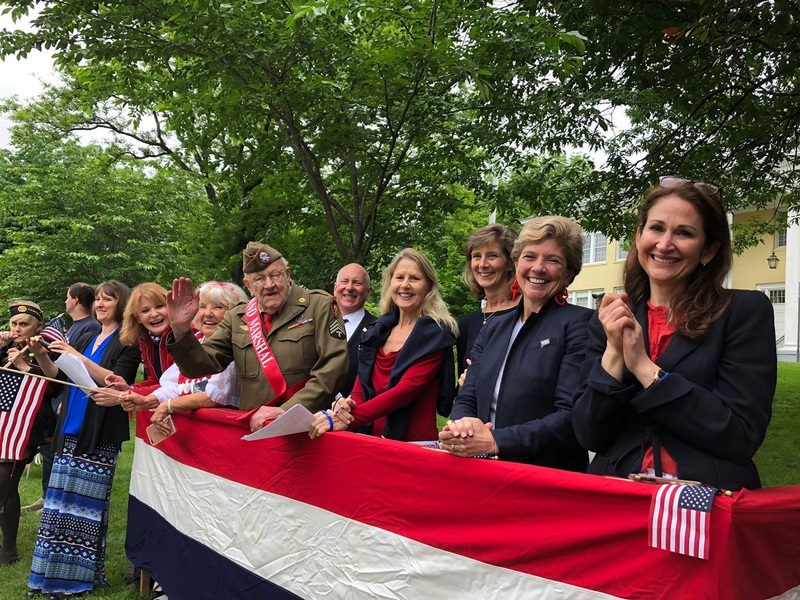 On Monday, Westport celebrates Memorial Day. 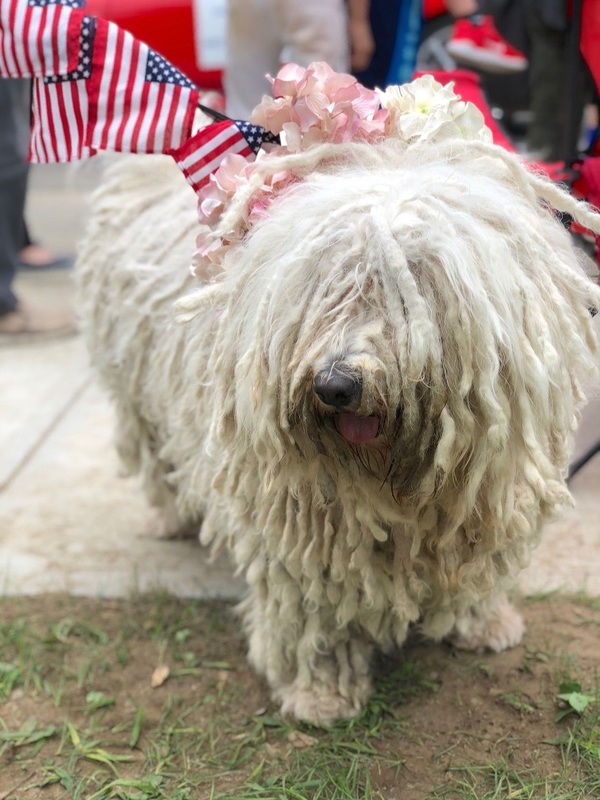 We do it with one of the town’s most popular and beloved events of the year: a fun, wonderful and wide-ranging parade, followed by a solemn yet uplifting ceremony across from Town Hall. It’s a huge undertaking. Hundreds of town employees and volunteers pitch in to make it all work. It seems effortless, but it’s anything but. None of it would happen, though, without the leadership of Bill Vornkahl. This will be the Westporter’s 49th year at the helm. 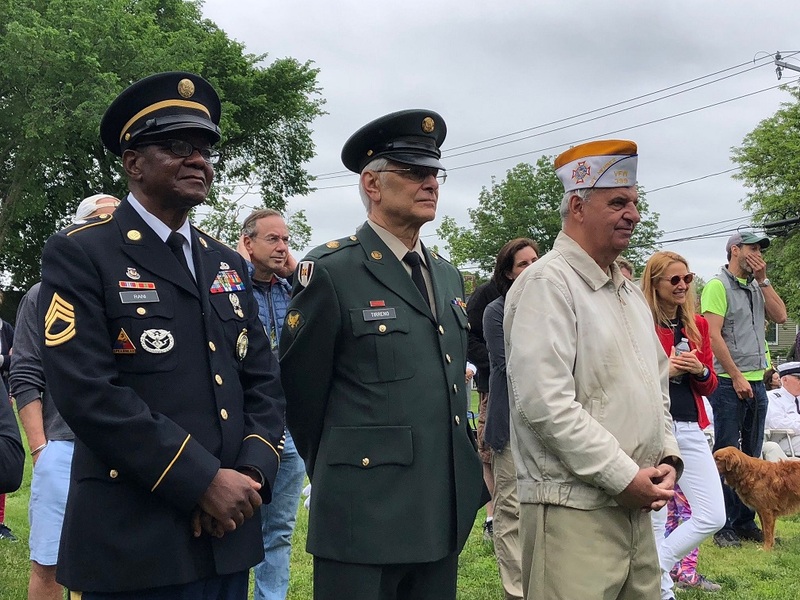 When he started in 1970, the parade may have included Spanish-American War veterans. 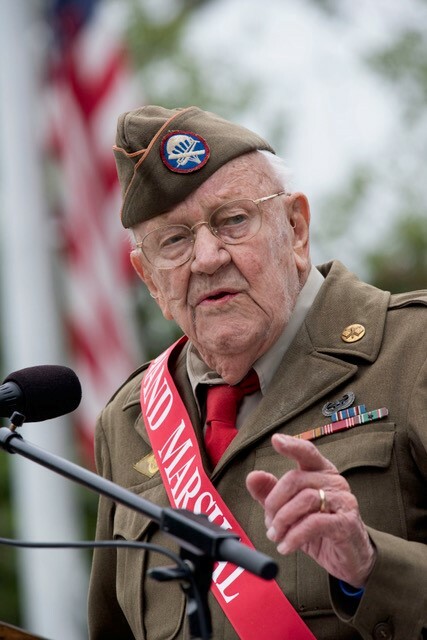 Today there are only a few who served in World War II. 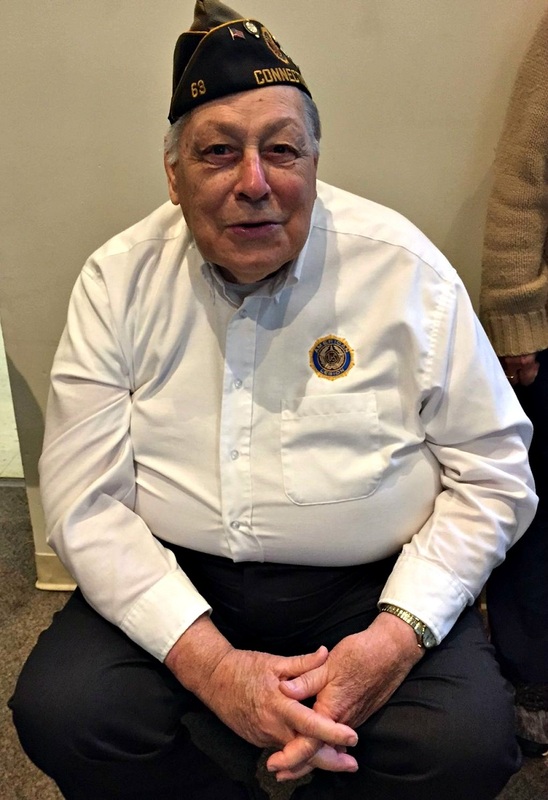 Vornhkahl — now 88 years old — is a Korean War vet. He spent 14 months on the island of Hokkaido, Japan, working as a high-speed radio operator in the 1st Cavalry Division. 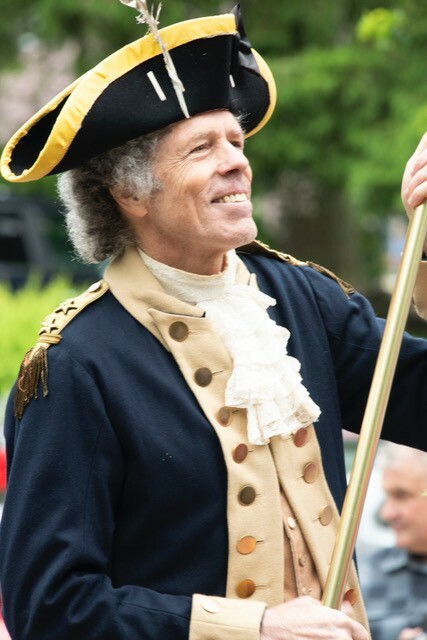 In 2013, he was inducted into the Connecticut Veterans Hall of Fame. 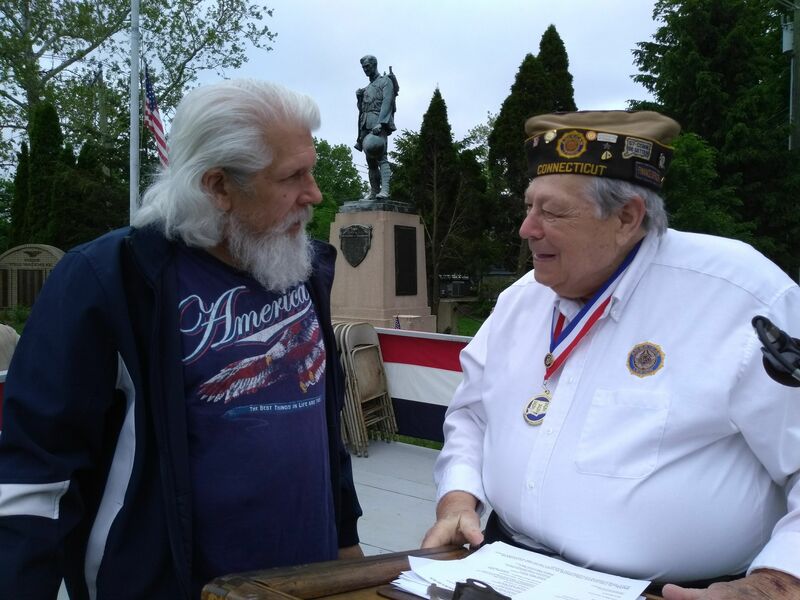 Vornkahl has been a member of the Westport Veterans Council even longer than he’s run the parade: 57 years. 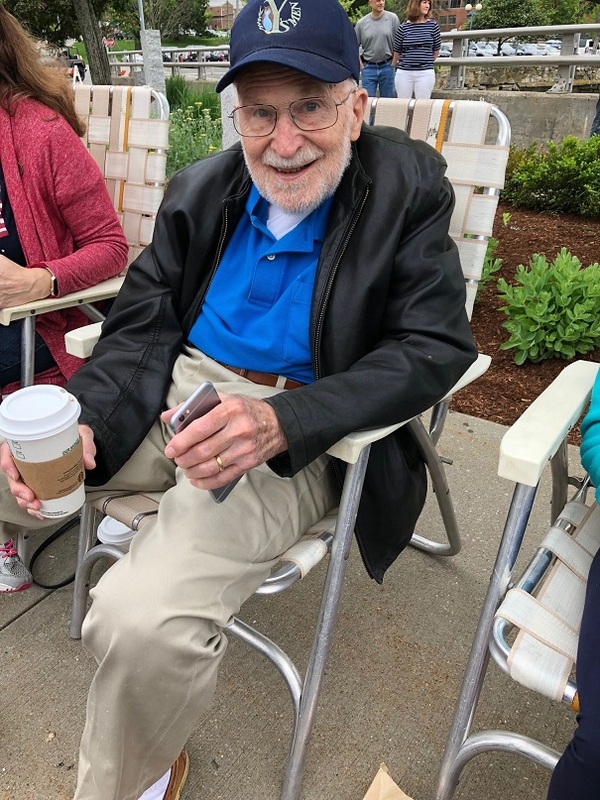 From 1996 to ’99 he was treasurer of Westport’s War Monument Committee, helping place memorials to various wars on Veterans Green. 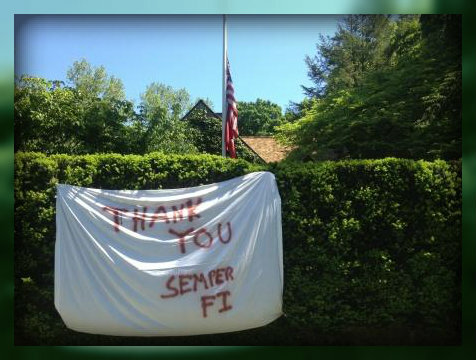 He joined the Greens Farms Volunteer Fire Company in 1950. 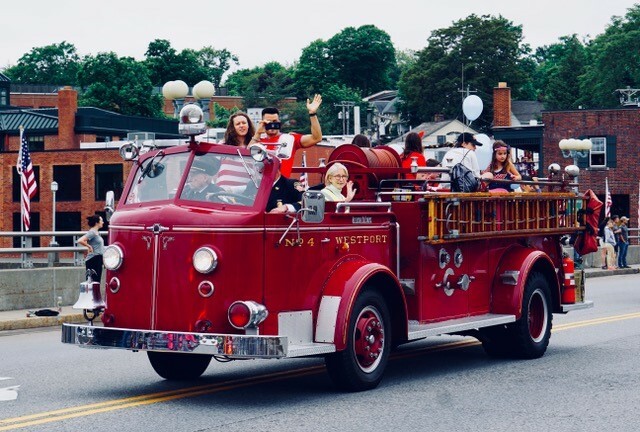 He’s served as secretary/treasurer of both that company and Saugatuck Hose Company #4, and as president of the Westport Volunteer Fire Company from 1973 to ’93. He coached Little League for more than 20 years, and for over a decade was part of the Staples High School football sideline crew. 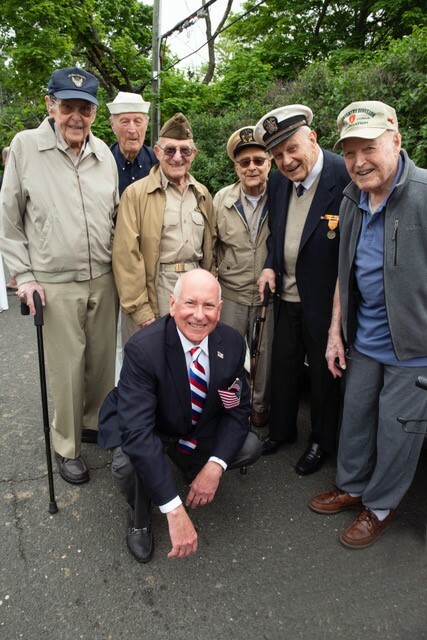 Vornkahl has dedicated his life to Westport. 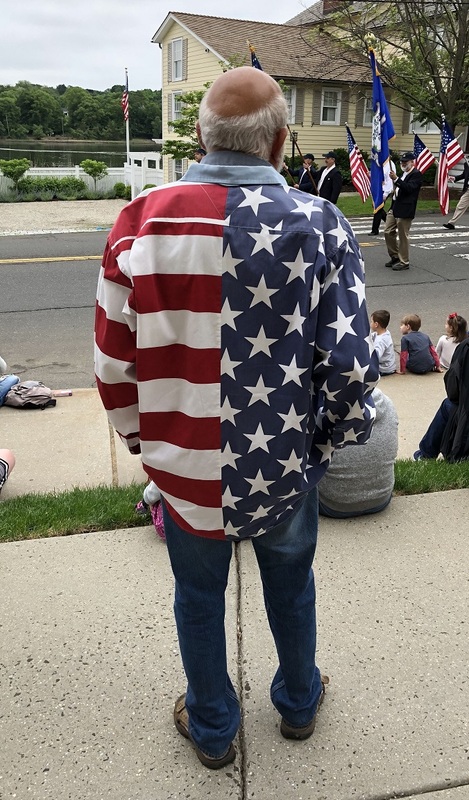 Of all he’s done, the Memorial Day parade is his special passion. He makes sure it all happens flawlessly. 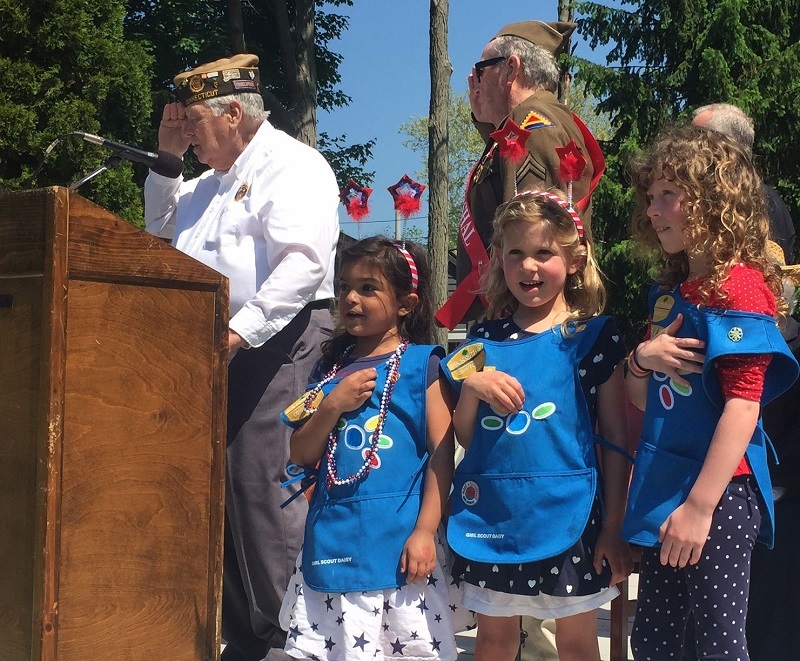 In 2015, Bill Vornkahl and 3 Girl Scout Daisies recited the Pledge of Allegiance. Of course, the one thing he can’t control is the weather. The last 2 years, predictions of rain have canceled the parade, and moved the ceremonies indoors. 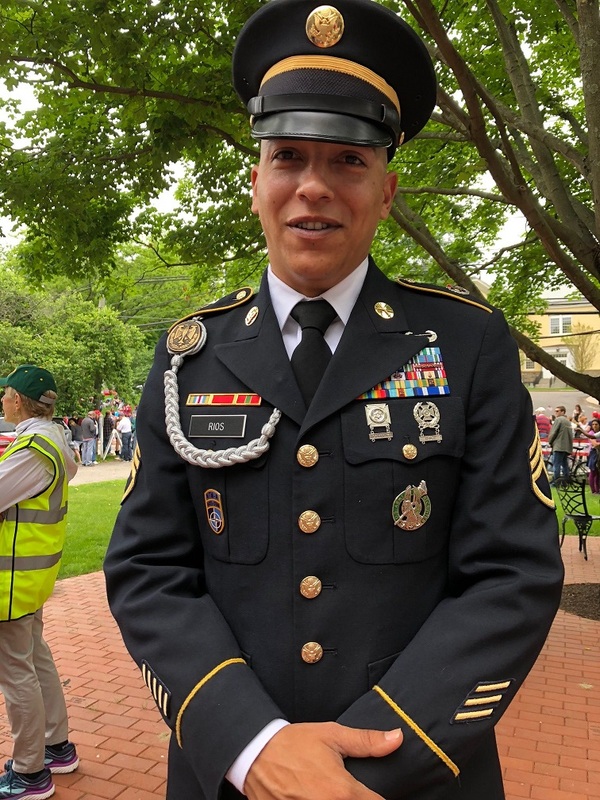 You may have seen him inside Town Hall, introducing the color guard, bands and speakers. This Monday, we all hope he’ll be outdoors on Veterans Green, doing the same. 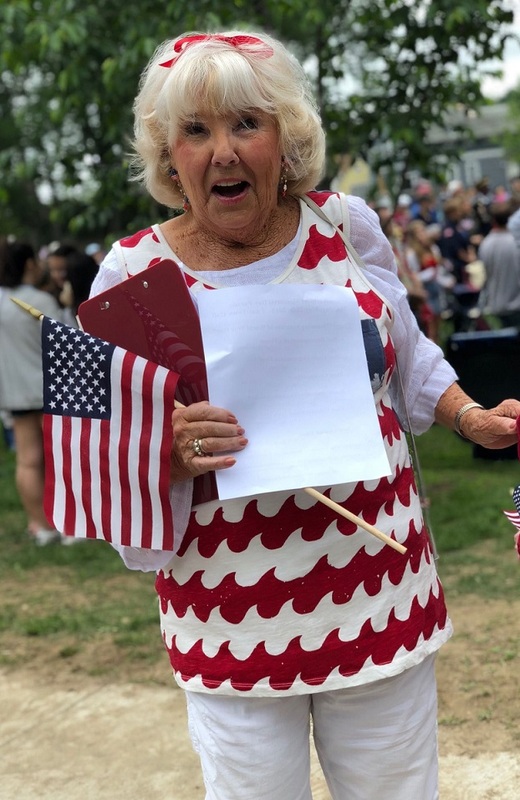 He’ll be busy — as he has been every Memorial Day since 1970. So now is the best time to thank him for all he does. Veterans usually don’t like honors. But Bill Vornkahl is a true Unsung Hero.